When French-born Caroline Charles was made redundant, pregnant with her second child, she didn't know where to turn. Here she explains how her childhood in the French Alps helped shape her new career and happiness. Losing my job was the catalyst that allowed me to escape post-natal depression and explore my creativity. Moreover, it gave me the chance to be true to my childhood craft influences from my early years in the French Alps - and regain my happiness. I was brought up in the French Alps and craft was very much part of life. Everyone around me was always cross-stitching, doing "tricotin,” crochet, sewing, knitting and drawing. My grandmother, mother and aunties - and some men like my dad too - all these unique characters that came my way influenced my relationship with craft. The memories of little things stay with me. Like dipping a biscuit in my tea and listening to those wonderful, enigmatic women around the table talking about life, their fears, problems and happiness.. When my first baby, Gabriel, was born in 2006, after hours of agony in an over-crowded St George's Hospital, his dad and I made the decision for me to stay home for six months. The six months soon became a year. Being away from my family did not help but thanks to lovely friends and neighbours I managed to find my way towards something I was more than happy with: a kind of normality. A year after my first baby was born I had a new house and was looking for a childminder. I was doing what I thought was expected of me - going back to work. But I was scared of going back and what to expect of this new life. Again. I was lucky enough to be offered my job back but mainly working from home with very little commuting to London. Working from home took a lot of the burden off my shoulders but proved to be quite challenging too. Staying within the same four walls 24/7 and trying to save a bit of money by looking after my little one was not the easy option I had hoped for. I wasn’t meeting up with anyone during the day and was having lunch by myself. You might have guessed already that I am quite a social person, to say the least, so this new lifestyle didn’t come easily. Early in 2008 I had a new boss. French, funnily enough, but she turned out to be not so funny. Even though I thought having a woman allocated to the head of my team might work in my favour, the concept of working from home did not appeal to her at all. So back to commuting again. How on earth do we do that? Train delays, extra costs for the childminder, running from here to there all day. And morning sickness...and then extra weight...and not forgetting the general exhaustion that comes from looking after a two-year old boy. I was by now two months pregnant and I had never felt so vulnerable in my entire life. I came back full of those big plans that often happen after a holiday. I ploughed some of my redundancy package into beads stock and a new computer and felt suddenly grateful for the extra money. I did a school fair and sold some jewellery to my friends. I was working like mad producing things and starting to get the knack of it. Knowing that when the second baby arrived I wouldn't have much time for myself spurred me on. In July 2008 Camille was born, a healthy baby girl. She was a planned caesarian, due to the fact that she was ‘placenta previa’. Although I was really scared about this new birth experience, and the risk implicated in the pregnancy, delivering in a smaller hospital (Epsom this time) made a big difference. We stayed in longer too due to the allocated recovery time. Camille was very relaxed and I felt more in charge. This time it felt like everything was ‘natural’ at last! When I come back to my two little devils-in-disguise I am greeted with the excited "Maman! Maman! Maman! We have done this and that...and we missed you!" This is what their dad always used to get, except of course it was always "Papa...Papa...Papa!" I feel stronger every day. I enjoy having this feeling of belonging to society and paying my due, not only as a mother. It really fills my heart with pride. My life today is full of expectations and dreams. 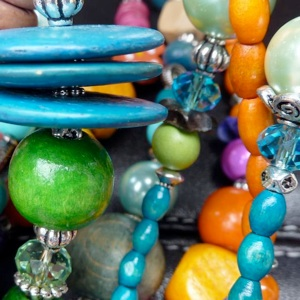 I would love my�Beadyjewellery�business to generate enough money to justify me working for myself until the kids go to full-time to school, and beyond. One thing I have learned is any dream can come true. Any woman can make hers come true. I hope you do too and that you enjoy it, every step of the way.